Former prisoner of war, politician, and eventual prisoner of England, Peter Baker used funding from his father to start the Falcon Press and began publishing around 1946. In 1947 Falcon Press joined with Grey Walls Press, started just before the war by English poet and author Charles Wrey Gardiner. Along with Grey Walls Press’s series of short poetry titles called the Crown Classics, Falcon Press issued a “co-series” Falcon Prose Classics, short prose collections that mimicked the format of the Crown Classics. 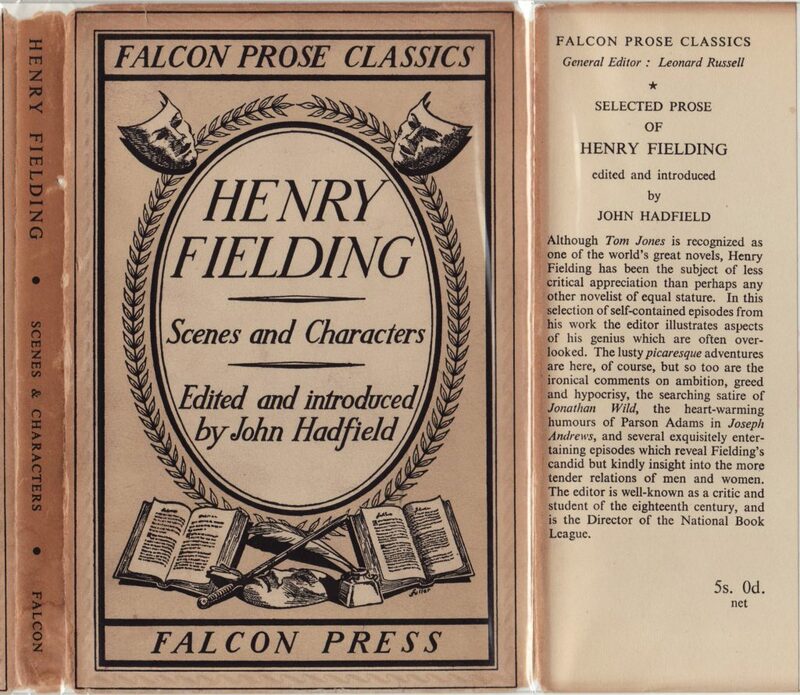 Falcon Prose Classics and Crown Classics were issued until 1953 when the firm’s financial troubles became acute. Baker had won a seat in the British Parliament in 1950. In 1954 Baker was tried and convicted of creating fraudulent documents to shore up his publishing company. Baker was expelled from Parliament and the Press folded. Novelist Muriel Spark worked for the Falcon Press / Grey Walls Press and wrote a novel based on Baker’s life called A Far Cry from Kensington (1988). 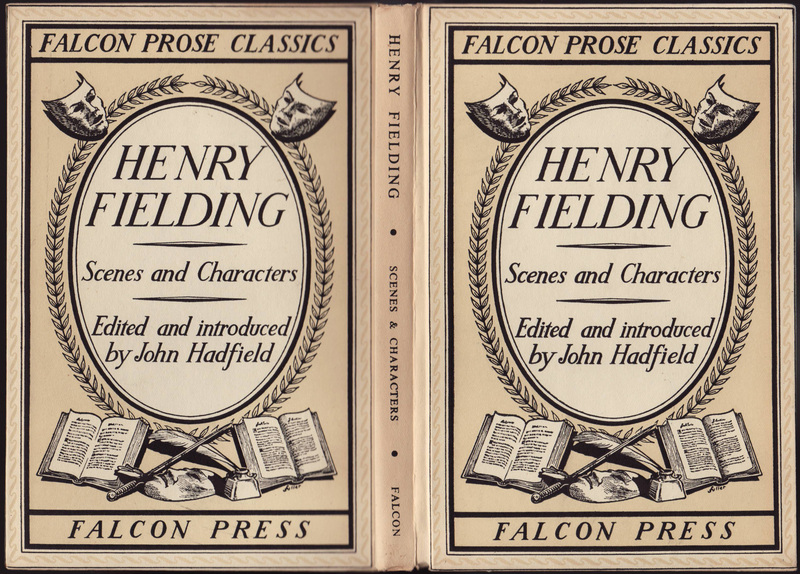 The Falcon Prose Classics jackets and bindings are very similar to the Crown Classics and were most likely designed by the same person. Both series follow the design approach of Chatto & Windus’ Zodiac Books – brief texts with distinguishing designs on both the bindings and jackets. 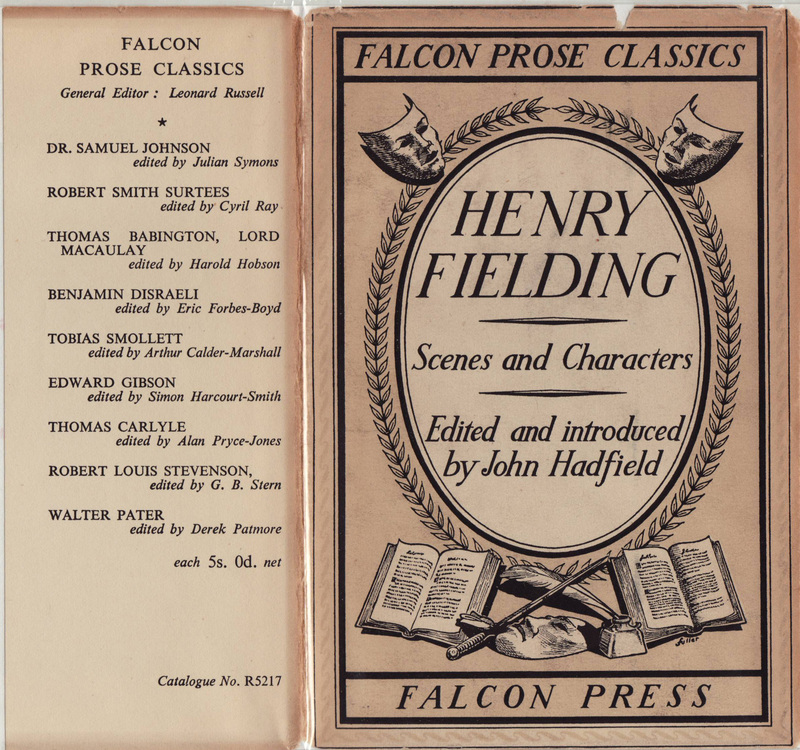 All the Falcon Prose Classics are edited selections and indicate the book’s editor. Gibbon’s Decline and Fall of the Roman Empire, for example, clocks in at less than 100 pages in the series. 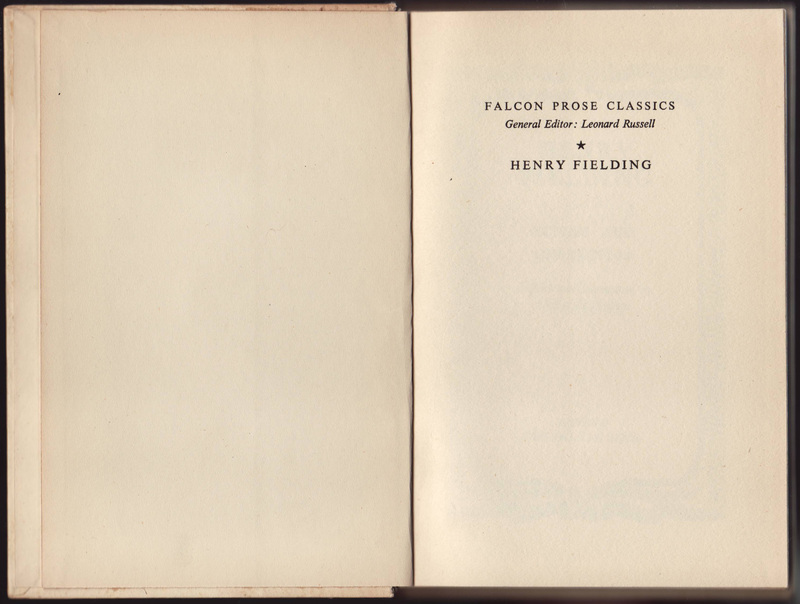 Jackets for the Falcon Prose Classics vary from title to title, with a few basic designs being reused in different colors along with some unique jacket designs for specific titles. Jackets exactly mimic the printing on the bookbinding boards, making it difficult to see from an image if one of the series books has a jacket. The series name is at the top of the front of the jacket, and also on the spine. 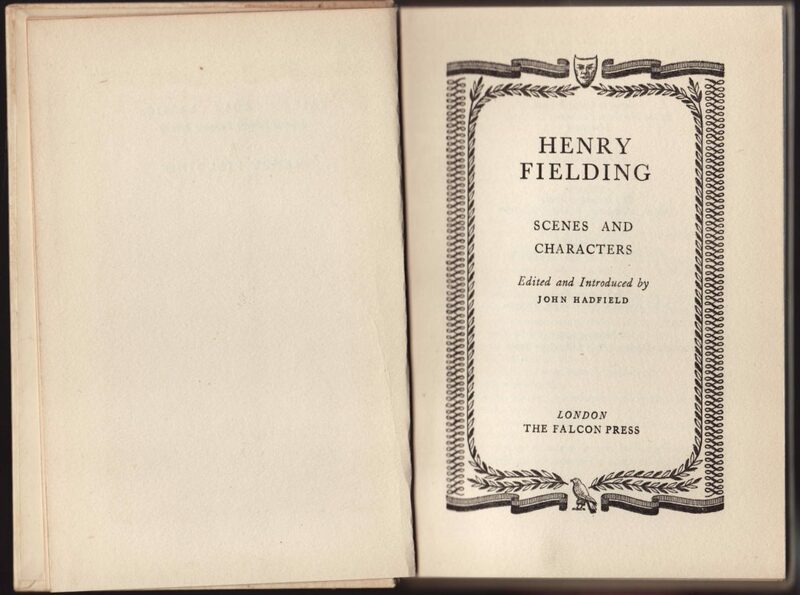 This copy of the Selected Prose of Henry Fielding was published in 1950 and edited by John Hadfield. The front jacket flap blurbs the title and includes the 5s. price. Additional titles in the series are included on the rear flap. The front jacket design is repeated on the rear of the jacket. The board binding has the same design printed on it as the jacket. A basic half-title page includes series name and series editor, Leonard Russell. 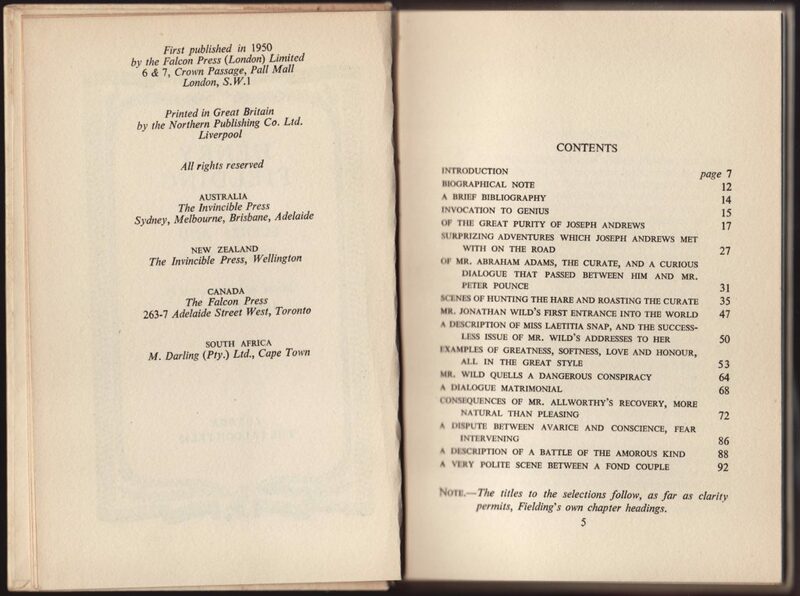 A rather lengthy copyright page includes the date of initial printing along with co-publishers in Australia, New Zealand, Canada and South Africa.